Before I show you my brilliantly edited video of last weekend’s agility fun match (look out Spielberg!) I wanted to say a couple things. Because that is what I do. 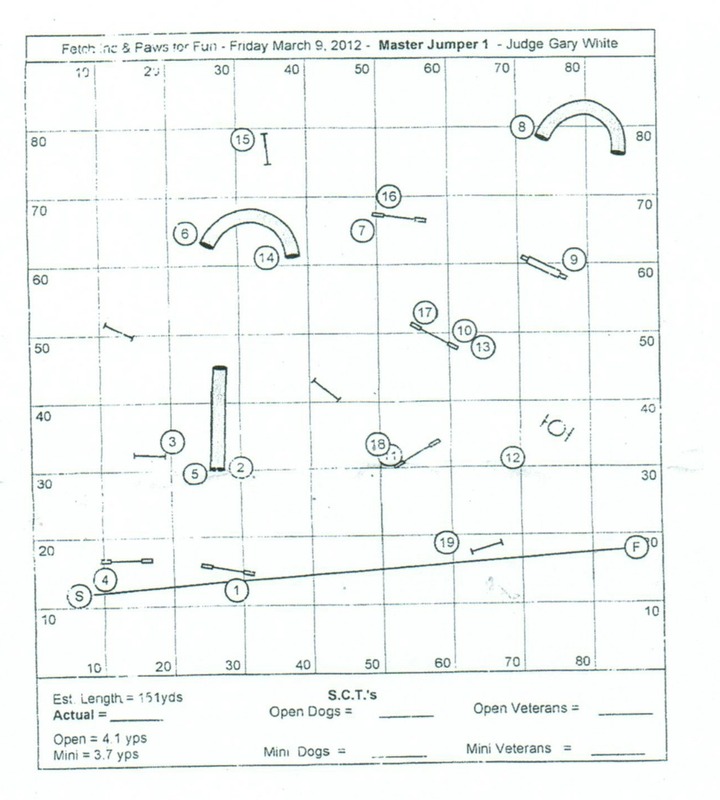 First, I want to emphasize that the course was a Masters level Jumpers course. Come to think of it, all the fun matches I have attended have been Masters level courses. This is either impressive, or really disheartening. I don’t know if it will mean anything to you, but I thought I’d show you the actual course map for the run we did on Sunday – just so you can get an idea of the layout. Handlers are also given about seven minutes to walk the course beforehand, which helps tremendously with memorization. Secondly, I also want to tell you that Shiva was jumping at 26 inches this time, as in all the jumps were set at 26 inches off the ground. At least they were supposed to be. Shiva was the first dog jumping at this height and I was not aware before we started that about half were set at 28 inches. I had only myself to blame for this. Shiva is my dog and it is my job to make sure everything is laid out properly for her. Since we normally practice with 22 at home, 26 often looks high to me. I didn’t even notice the extra two inches on top of that. It wasn’t until the next dog began that the mistake was pointed out. The crazy thing? Shiva had no issues flying over all 28 inches. It makes me wonder how high she could go! The ugly: My handling skills… Yeesh. Immediately after we were done I started going through our run in my head and thinking about all the ways in which I made it harder for Shiva, all the times in which my shoulders were facing the wrong direction. The push on jump 4 stands out in my mind the most. If I’d just done a front cross after the jump… Oh well, that’s what practice is for, right? The happy: This was a brand new environment for Shiva with lots of news smells. Yes, she ran off, but she came back almost right away and all on her own. My PH didn’t have to drop the camera this time to help retrieve her. That was a definite tear-jerking moment for me. For so long we haven’t been able to get ahead because Shiva keeps zooming around instead of focusing on the job. Now that she finally has value for hanging out with me, maybe we can work on the more intricate handling stuff. Yay! The bonus: I don’t know if you could tell but I was using a tug toy as a reward. Not a grocery bag, not a half-eaten treat pouch, but an actual tug toy. What’s more Shiva was actually enjoying tugging on said toy in public, ie. the tug toy was actually rewarding her! It’s an agility miracle! Thanks for all of your support! It really means a lot to know you are out there rooting for us! Yay! Congrats! Shiva looks like she is having SO much fun. Every time I watch your videos I get re-motivated to try agility with Pearl, it honestly looks like a blast. Yay Kristine and Shiva, that was pretty good. You’ll both get better as you practice and go to more trials. I can probably do tunnels really well like my sister. First of all … wow, that is one TOUGH course! Lots of wraps and serpentines in tight quarters. Shiva has a lovely lead-out, and I thought she seemed very game and willing to work through the course with you. I looked at the course map before watching the vid — obsessed much? Yeah, that’s me. I actually said to myself, “well, 14 to 15 is going to make a dog think he’s going back into the tunnel.” I thought it was extra clever of Shiva to trying jumping ON the tunnel, since clearly going through it twice wasn’t correct :). Yayyy!!! She looks like she had a BLAST and that’s what it’s all about! So much more focused and “into” the game this time around… very nice job (that was NOT an easy course… holy cow)! This is great! I’m so impressed with you both! Have you taught her a Go Out yet? I feel like she’d benefit so much from that, especially in those jump chutes. MASTERS LEVEL?! Seriously? I’m so impressed right now. I lol’d when she jumped on the tunnel – silly puppy! You guys make it look like so much fun and that is the only important thing when we are with our dogs. I can only imagine how much time you have put in. WOW! Shiva was great. She sure can jump. First I did notice right away that you were using a tug toy and I was so proud of Shiva I know that had been something she was not interested in previously so what a huge accomplishment! And second, that pup has WINGS!!! LOL And what I love the most about watching you and Shiva work is how much fun she seems to be having. She smiles the entire time that must make you very proud to know that you are offering her such a fulfilling life! Keep up the good work! AW! That was **awesome** SO AWESOME! Way to go you two! I wish I understood agility better so that I could understand better what is going on. lol I think the biggest thing I noticed was how much closer Shiva was to you and that you guys felt tight and together. As in there was less physical space between you two as well as mental. She still looks so loose and free but her maturity level is really getting up there. You two looked more in tune with each other and working more as a unit. I’m really impressed with how tight you were. And Kristine, do you really have to question how high those long, bouncy legs can jump?? BOL!! I really enjoyed watching that! It seems such a complicated course (not that I know anything about agility). I couldn’t wait for her to go through the doughnut 🙂 Boy, can Shiva jump! I think I’d need a lot more than a drawing and 7 minutes to remember the sequence. I also looked at the course map before the video and I couldn’t even find #1 for at least five minutes. That looked like a very tough course. And I had no idea Shiva could fly. She looked beautiful. And more importantly, she looked happy. You two are really working as a team now. You have so much to be proud of. Shiva sails over those obstacles! I’d be curious to see just how high she can go! Nice job on the jumping! It looks like Shiva has springs in her feet!! Why don’t you mess around with the height at home and see how high she can fly? You guys look great. (I know, you’re all worried about what you are doing, and that’s what you should do, because that’s what we all do – but in the meantime…) She’s having fun and you are smiling and that dang tunnel was just too confusing. I guess Shiva has a lot of confidence so she was able to clear those 28 inches. For me, that is a sign that you better set up more challenging tasks for her. Shiva loves her those tunnels doesn’t she? LOL You and she did great. I don’t know how you remember the course. It looks so complicated. I still can’t get over how fast she is. When it all comes together, she is really going to fly. I’m really blown away by how far you and Shiva have come in agility. It seems like just yesterday she was getting confused and distracted on even much simpler courses, and now, look at her fly! Well, I think you both look great, but I don’t know much about agility, so I don’t know if I’m the most reliable source. Still, I think you’re going to really be glad one day that you and Shiva built such a solid foundation! Wow, that looked like a tough course! Lots of subtle tricky places! I think you guys are easily ready to handle a novice course at a real trial!!! Do you plan on doing USDAA with her since she’s jumping 26? I’m actually starting a beginners’ agility class in a few weeks – makes seeing all the stuff you guys can do even more exciting! You guys are so fantastic! I’m amazed at how Shiva can jump and how much fun you both look like you’re having. Keep up the good work.